We've been feeding our pups freeze dried dog food for some time. It contains all of the benefits of raw food, but in a safe and convenient freeze dried form. More and more pet parents are realizing the benefits of freeze dried dog foods to help give their pups the balanced nutrition they need to remain strong, happy and healthy. However, as more people make this decision more choices appear on the market which is great news to the consumer, but can be confusing. Which freeze dried dog foods should you consider for your furkid? To help you make the right choices here is a look at the top 5 freeze dried dog foods that are available right now, based on both our experiences and the opinions and observations of other dog parents who have purchased and loved these recipes too. If you haven't tried feeding your pup freeze-dried foods, I suggest you give it a whirl - it's a convenient, affordable way of feeding your dog a natural, healthy raw diet...the way dogs should eat! First Five Ingredients: Chicken, Organic Flaxseed, Potatoes, Celery, Sweet Potatoes. This dog food is actually billed as human grade (i.e. fit for human consumption), although it is safe to assume we haven't put that claim to the test....yet :)! However, saying that this freeze dried dog food makes use of some very high quality ingredients. It's also low-protein, grain and gluten-free, GMO-free, and has no corn, wheat or soy and can be fed to all breeds. The primary ingredient is freeze dried free range chicken, which offers just the right amounts of lean protein to satisfy the protein needs of most adult dogs. But the formula also includes bananas, de-cored apples, blueberries and pumpkin chunks. These fruits offer ample amounts of essential antioxidant vitamins and essential minerals. Crude proteins (24%), crude fats (15%) and fiber (6.5%). 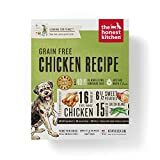 We found this freeze-dried dog formula excellent as a topper in addition to dry kibble - we trust Honest Kitchen and rely on their local sourcing. Both of our pups jump up and down while I make their dinner and they gobble it up every time. They both have excellent coats and good energy from it. Once the food has been hydrated and turns into fresh food, you can fridge it for up to 2-3 days or freeze it for a month. Equally, other pet parents praise it for the high quality of the ingredients - which are limited in number to help prevent stomach upsets - as well as the ease of dehydration at meal times. They also almost universally report that their pups love the taste as well, a big bonus, as however good a freeze dried formula is on paper it is useless if a pup simply refuses to eat it. While some only make us of it as a topper, it can be fed as a primary food and a number of pet parents report doing so with great success. First Five Ingredients: Lamb Heart, Lamb Liver, Ground Lamb Bone, Squash, Apples. 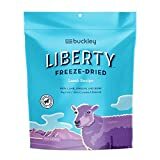 This affordable freeze dried dog food makes use of a less usual primary protein - lamb - which is a leaner meat that is protein packed but offers a lower fat content. This grain-free formula makes use of both lamb meat chunks and lamb organ meat. Organ meat offers the advantage that it is a lean meat that is extremely rich in vitamin and minerals, especially iron, B vitamins, vitamin E and manganese while also being an excellent source of protein. Crude proteins are 45%, crude fat 36% and fiber 5%. This is a limited ingredient food, something that some pet parents report is very beneficial for their food allergic pups, but it does also include blueberries and cranberries, both of which are an excellent source of essential antioxidant vitamins, as well as salmon oil which provides a rich source of Omega 3 and Omega 6 fatty acids. This is another popular choice particularly for dogs with sensitive stomachs and picky eaters. It's easy to prepare and when rehydrated it offers a consistency that is closer to a standard chunky wet dog food rather than a 'mush' which is why it's more palatable to dogs. Again, use it as a topper with high quality kibble or as a standalone meal. This high quality meal blend comes in two other protein options: beef and chicken. First Five Ingredients: Chicken, Salmon With Ground Bone, Chicken Liver, Chicken Gizzard, Pumpkin Seed. If you have a puppy, guaranteed he'll love Stella & Chewy. I've used their freeze dried products for several years. Puppy pet parents know that they have to be especially mindful that they feed their young furkid a nutritionally adequate diet that will help them develop and grow as best they can. 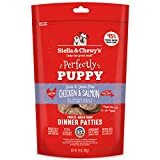 Stella & Chewy's Perfectly Puppy Chicken & Salmon Dinner Patties Freeze-Dried Raw Dog Food is a popular choice with puppy pet parents, not as a complete meal but as a topper and/or high value treat that provides additional nutrition, along with a high quality puppy kibble. Both the cage-free chicken and wild-caught salmon are sourced from organic farms and are freeze dried very quickly to ensure that all of the protein, vitamins and minerals they contain are preserved as completely as possible. This puppy freeze dried food offers 45% crude proteins, 27.5% crude fats and 5% crude fiber. The formula also includes New Zealand Green mussels, a great source of Omega 3 fatty acids and is supplemented with both the brain boosting amino acid DHA and the brain building folic acid. Puppy parents are, on the whole, delighted with this freeze dried puppy food. Puppies love love the taste and the texture of it and owners like it because it's easy to prepare. It seems that it is especially popular when used as a topper for large breed puppies and as a primary standalone meal for small breed pickier puppies who have not thrived on standard puppy kibble alone. Stella & Chewy’s offer eight other blends for freeze-dried dog food for both adult dogs and puppies. First Five Ingredients: MSC Certified Pollock, MSC Certified Cod, Sweet Potatoes, Eggs, Organic Coconut. Another offering from the Honest Kitchen range of dehydrated dog foods this formula highlights wild-caught white fish. White fish, which in this formula includes both cod and haddock, is a high-protein, low-calorie lean protein that is also a great source of the essential Omega 3 and Omega 6 fatty acids that are believed to help improve coat, skin, brain and joint health. 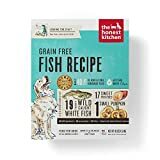 The white fish is provided in freeze dried chunks that are sized to suit most pups needs and the formula also includes cranberries, coconut, white potatoes, apples, bananas and whole eggs. The protein (crude) level of this formula - 35.5% - is highest offered by any of the half dozen Honest Kitchen freeze dried dog food formulas, making it a great choice for large dogs who have higher protein needs than smaller dogs but do not benefit from a great deal of bad fat or too many empty calories. Crude fats are 8.5% and crude fiber is 5.8%. Since since it doesn't contain common allergens like flaxseed, white potatoes, grains or gluten, this grain-free formula is particularly good for dogs with digestive issues prone to loose stools and diarrhea. Fish is a rich source of Omega 3 & 6 fatty acids which is why dogs with skin or coat issues would get the most benefit. You should see a visible improvement in the shine and lustre of your pet's coat after a few weeks. And the taste seems to be very popular right across the board. 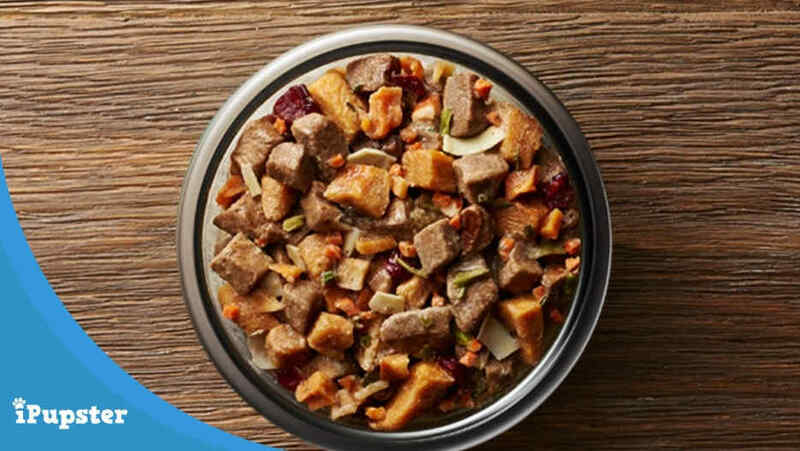 While you can use this food as a topper only with a high quality kibble as an accompaniment others, especially small dog owners, choose to feed it as a primary source of food and their pups seem to thrive on it. First Five Ingredients: Turkey, Sweet Potatoes, Cranberries, Flax Seeds, Whole Egg. As pups age their nutritional needs change, especially when it comes to getting the nutritional building blocks they need to protect their aging joints, eyes and to preserve their lean muscle mass. This formula seeks to address the needs of senior dogs as completely as possible. It is a grain free formula - something that is often very beneficial for older dogs with digestive issues - and its primary ingredient fresh turkey, is an excellent source of lean protein that is also lower in fat. As senior dogs tend to be less active than they once were a lower fat diet helps them maintain a healthy weight to reduce the strain on their joints. This blend offers min. 26% crude proteins, min. 12% crude fats and min. 5% crude fiber, with only 286 kcal/cup. Of interest to aging dogs are the GLUCOSAMINE and CHONDROITIN levels found in this blend which are 300mg and 200mg respectively - and aid in an aging dog's joints. This senior dog food formula also includes wild caught salmon - a great source of Omega 3 fatty acids that offer coat, skin, brain and joint health protections as well as cranberries that are an excellent source of essential antioxidant vitamins. This another very popular option with dog owners. Those who praise this it do so quite effusively. When used as a standalone primary food source dogs get a noticeable increase in energy and ease of movement, as well as an improvement in a pup's skin and coat. Pups love the taste and are owners are pleased with how easy it is to prepare and the excellent texture that results after it is rehydrated. Just add water, soak it to activate the nutrients and enzymes and serve it to your pup! He'll dive right in! As we mentioned, freeze dried dog foods have only fairly recently begun gaining popularity among pet parents worldwide. However, for those who are not familiar with them the choice can be hard to understand, especially when it comes to determining what benefits these foods offer over standard dry kibbles, especially when the highest quality kibbles do seem to offer all of the nutrition pups need. There are however benefits to choosing a freeze dried dog food that as a pet parent you might want to consider. Freeze dried dog foods offer what are usually very high quality ingredients. These often include nutrient dense organ meats, as well as lean muscle meats and as the fruits and vegetables used are often flash frozen at the source and dehydrated quickly they tend to retain more of the vitamins they contain that offer so many health benefits to dogs of all sizes, breeds and ages. Look for AAFCO approved dog foods - this way you can rest assured that your dog meets the minimum nutritional requirements. A growing number of experts do recommend that dogs follow a raw diet. A study conducted by researchers at the University of Chicago found that among their sample of healthy dogs raw foods were tolerated in terms of digestion more successfully than standard kibble and that the raw diet resulted in lower blood triglyceride levels. Triglyceride levels, when too high, can lead to heart disease, so this benefit may be especially important for larger dogs, some of which are genetically predisposed to heart problems. The difficulties with a raw diet for dogs however are quite numerous. Raw meats are expensive and can be hard to source properly. They can also be difficult and dangerous to handle, and with meats like chicken especially, the potential for food borne bacteria development is high. Freeze dried foods are, therefore, a safer, more convenient way to offer a raw food element in your pup's diet as well as a way to include a wider variety of protein options. Freeze dried foods are often used by members of the military as their primary sources of nutrition when out in the field because they have such a long shelf life and can easily be prepared almost anywhere. These benefits can extend over to freeze dried dog foods too. Their long shelf life means that pet parents can always be assured that they have food on hand that is still fresh and good to eat. My dogs love the taste of freeze dried dog foods when it's properly prepared. As they have the same tastes and textures as raw food they are often more appealing in general and palatable. Another advantage is the volume and density of their stool which improves as the foods lack the 'fillers' that some kibbles unfortunately include. The Difference Between Dehydrated and Freeze-Dried Foods? Dehydrated dog foods have been around for some time too, so it is easy to confuse the two. So what is the difference and why does it matter? To create dehydrated food, water is extracted from food by putting it into a low heat environment for a set period of time. Freeze drying begins with recently frozen fresh foods that are then placed into machines that serve to lower atmospheric pressure around the food and the water content transitions from ice into gas. Because it is heated when being prepared dehydrated food is considered to be slightly cooked. Freeze drying, as it involves no heat at all, therefore produces a dehydrated product that is closer to the original raw state and often more of the essential vitamins and minerals are retained. Many dog owners, often for reasons of economy, choose to offer freeze dried dog food as a topper along with a high quality kibble, although some do commit to feeding their pup nothing but freeze dried foods, those who would, if they could, probably transition their furkid to a raw food diet completely. Which you choose to do is up to you, your pup and perhaps your vet as well, as they are the best people to consult with to ensure that a transition to freeze dried dog food still meets all of your pup's nutritional needs.